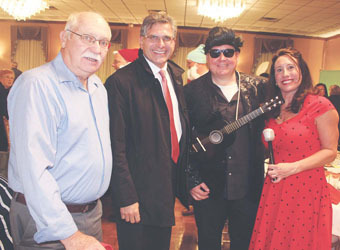 Ray Monkiewicz, City Manager Tom Ambrosino, Matt Monkiewicz (Johnny Cash) and Jennifer Monkiewicz (June Carter Cash). Anthony Ciapppina, 46, 7 Jefferson Dr., Revere, was arrested for trespassing. Victor Dudley, 46, 153 Belleville Ave., New Bedford, was arrested for breaking and entering daytime, attempt to commit a crime, refuse to identify self, failure to yield at intersection, one way violation, failure to stop for police, furnishing false name, felony warrant and default warrant. Katelyn Ferguson, 28, 86 Division St., Chelsea, was arrested on a warrant. Jorge Cora, 52, 36 Cottage St., Chelsea, was arrested on a warrant. Angel Prates-Diaz, 18, 70 Waite St., Revere, was arrested for courtesy booking. Colin McQuade, 46, 17 Louis St., Chelsea, was arrested for courtesy booking. Manuel Chajon-Ramos, 36, 16 Cottage St., Chelsea, was arrested for operating motor vehicle unlicensed. Jacqueline Trinidad, 29, 34 Grove St., Chelsea, was arrested for unarmed robbery, sexual conduct for a fee, assault and battery, furnishing false name, malicious destruction of property over $250, warrants. Joseph LeBlanc, 52, 57 Hutchinson St., Winthrop, was arrested for sexual conduct for fee, assault and battery, and malicious destruction of property over $250. George Rovira, 18, 34 Grove St., Chelsea, was arrested for breaking and entering nighttime. Mary Sackor, 29, 25 Seanford St., Boston, was arrested for intentionally, willfully and maliciously or wantonly damages, burn personal property, disorderly conduct. Juan Perez, 35, 245 Eustis St., East Boston, was arrested for possessing Class B drug, conspiracy to violate drug law. Shauna Keller, 24, 77 Columbus Ave., Braintree, was arrested for warrants and shoplifting. Jeremy Lookdo, 31, 62 Falcon St., Boston, was arrested for shoplifting. Jairo Rodriguez, 23, 150 Shawmut St., Chelsea, was arrested for assault with a dangerous weapon. Daniel Ghidella, 46, 50 Kimball Rd., Chelsea, was arrested for disorderly conduct. Abel Reis, 52, 204 Washington Ave., Chelsea, was arrested on a felony warrant. Fallon French, 32, 124 Washington Ave., Chelsea, was arrested on a warrant. Whitney Baskin, 30, 97 Broadway, Malden, was arrested on a warrant. Jennifer Spinelli, 26, 28 Swan St., Everett, was arrested for being common nightwalker. Stanley De-Vorce, 54, 466 Broadway, Chelsea, was arrested for indecent exposure, drinking/possessing open alcoholic beverage in public. Nicholas Marcheti, 21, 194 Lincoln Ave., Saugus, was arrested for tagging property, trespassing, deface property. Robert Rossetti, 59, 8 Carmel St., Chelsea, was arrested for drinking/possessing open alcoholic beverage in public, assault, resisting arrest, threat to commit crime, disorderly conduct. Kelvin Vasquez, 35, 977 Broadway, Chelsea, was arrested for shoplifting and warrant. Thomas Rourke, 54, Homeless, Boston, was arrested for shoplifting and warrants. Jennifer Spinelli, 26, 28 Swan St., Everett, was arrested on a warrant. Steven Mejia, 24, 63 Central Ave., Chelsea, was arrested on warrants. Ernesto Marrero Lopez, 57, 178 Central Ave., Chelsea, was arrested for indecent exposure. Jennifer Newcomb, 34, 24 Mason St., S. Weymouth, was arrested for sexual conduct for a fee. Dominic Parrish, 20, 2 Parkway Ct., Chelsea, was arrested for warrants. Michael Frada, 54, 8 Grove St., Chelsea, was arrested on a warrant. Mary Caraballo, 23, 472 Riverside, Lawrence, was arrested on warrants. Ariel Zarzar Jorge, 20, 118 Orange ST., Chelsea, was arrested for failure to stop for police, unregistered motor vehicle, uninsured motor vehicle, unlicensed operating of motor vehicle, leaving scene of property damage. Nain Montiel, 44, 87 Garland St., Everett, was arrested for drinking/possessing open alcoholic beverage in public. Jose Aguilar, 48, 23 Orange St., Chelsea, was arrested for drinking/possessing open alcoholic beverage in public. A committee is organizing the August 27 sixth annual Multi-Chamber Barbecue Fundraiser. The event will benefit North Suffolk Mental Health and be held at East Boston Neighborhood Health Center. Pictured above, front row, from left, are Dr. Deborah Wayne, Committee Chair Saritin Rizzuto, and Sherri Raftery. Back row, from left, are Stephanie Scopa, Mayra Ventura, Jennifer Stutto, Miriam Irvin, and Buddy Mangini. The Network for Teaching Entrepreneurship (NFTE) has honored Chelsea High School (CHS) teacher Catherine Doherty and former CHS student Jennifer LaSala as the student and teacher of the year for New England. A few years ago, Doherty began teaching an entrepreneurship class at CHS, and it was met with wild enthusiasm from the kids at CHS – many of whom were excited to learn about starting their own business. One of the first students in Doherty’s class was LaSala, a CHS 2011 graduate. She was able to take her idea from Doherty’s class and turn it into a burgeoning career. LaSala, now CEO of Sugar Coated Heaven, was honored for such as the New England recipient of the 2013 Young Entrepreneur of the Year, joining tens of others from across the nation in receiving this prestigious award. In the past two years, Jennifer turned her fledging high school NFTE business idea, Sugar Coated Heaven, into a flourishing business due to open its bakery doors this summer in Providence, where Jennifer attends Johnson & Wales University. Equally proud is NFTE New England of Doherty, a dedicated NFTE teacher at Chelsea High for three years running, who was honored as the 2013 NFTE Entrepreneurship Teacher of the Year for the New England Region. Doherty has worked hard to extend her students’ learning by bringing a Level 2 class to her school as well as developed new curriculum materials that are used throughout the NFTE organization. Both LaSala and Doherty were honored at a special award ceremony and had the opportunity to meet NFTE’s young entrepreneurs and teachers from around the globe at a NFTE 25th Anniversary Gala held on April 23rd at New York City’s Waldorf Astoria. Social entrepreneur and renowned educator, Steve Mariotti, founder of NFTE, was also honored. The event, supported by MasterCard Worldwide and Goldman Sachs 10,000 Small Businesses, recognized 37 outstanding young entrepreneurs from 10 different nations, alongside 25 entrepreneurial educators. Today, NFTE is an international non-profit organization committed to engaging and inspiring youth in low-income communities around the world to pursue educational opportunities, start their own businesses, and succeed in life.